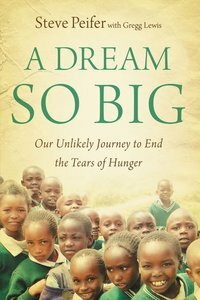 A Dream So Big is the story of Steve Peifer, a corporate executive who once oversaw 9,000 computer software consultants, who today helps provide daily lunches for over 20,000 Kenyan school children in thirty-five national public schools, and maintains solar-powered computer labs at twenty rural African schools. Steve and his wife, Nancy, were enjoying a successful management career with one of America's high tech corporate giants during the dot-com boom of the 1990's when, in 1997, he and his wife Nancy discovered they were pregnant with their third child. Tragically, doctors said a chromosomal condition left their baby 'incompatible with life.' The Peifers only spent 8 days with baby Stephen before he died. Seeking to flee the pain, Steve and Nancy began a pilgrimage that thrust them into a third-world setting where daily life was often defined by tragedy---drought, disease, poverty, hunger, and death. They didn't arrive in the service of any divine calling, but the truth of their surroundings spoke to their troubled hearts. A short-term, 12-month mission assignment as dorm parents for a Kenyan boarding school turned this ordinary man into the most unlikely internationally recognized hero, and his story will inspire you to pursue similar lives of service. About "A Dream So Big"
Steve Peifer serves as Director of College Guidance for Rift Valley Academy in Kijabe, Kenya. He established a rural food program in 2002 that provides lunches for 20,000 Kenyan schoolchildren a day. He has also built the first solar-powered computer-training center in Kenya, and is now developing twenty computer classroom labs for rural schools. For his work on behalf of Kenyan children, he was awarded the CNN Heroes Award for Championing Children in 2007, the 2007 Yale Counseling Award and the 2010 NACAC Excellence in Education Award. Steve and Nancy have four children, two in college and two living with them in Kenya. Gregg Lewis is an award winning author or coauthor of more than fifty books, including Take the Risk and The Big Picture with Dr. Ben Carson, Tom Landry: An Autobiography, Forgiving the Dead Man Walking with Debbie Morris, Jesus M.D., and Safe at Home. SPANISH BIO: Gregg Lewis es autor y coautor galardonado de mas de cincuenta libros, incluyendo Arriesgate y Vision Global con Ben Carson, Tom Landry: Una autobiografia, Jesus M.D., y A salvo en casa. el y su esposa, Deborah, tienen cinco hijos y residen en Rome, Georgia. Customer Reviews For "A Dream So Big"
I didn't expect to be totally taken in by this book, but oh my, it is way more than it seems from the cover. Probably the biggest attraction for me was reading about another international school, yet one that is in a totally different context to ours. Rift Valley Academy (RVA) is in Kenya, on the eastern side of Africa, way up the side of a mountain. It isn't in the big city, and is surrounded by heart-wrenching poverty. Students don't commute there via trains as they do at CAJ, the vast majority of them live on-campus. The author of the book (or at least the main one, he had a co-author), calls himself the least likely of missionaries. He and his family ended up in Africa in a bid to make a new start after their third boy was born with deformities incompatible with life, and only lived a few days. First off they only went to Africa for a year, as boarding home parents at RVA. The early chapters are sprinkled with hilarious descriptions of what it is like to run a dorm full of 10 year old boys. Descriptions that I, and my family of boys, could easily relate to. I read some portions out to my family and we were nearly on the floor laughing. That is the cleverness of this book: the authors' abilities to weave humour into a story that is bleak at times. For both the story of the loss of his son and the devastating hunger and poverty that they saw in Africa are not at all funny. Just before they were about to go back to their usual corporate lives in America, Steve saw Kenyan children lying on the floor in a classroom. He asked the Kenyan teacher why. Her reply was, "They haven't eaten since Sunday, it's now Thursday, if they sit up, they'll faint." After that Steve found he couldn't remain in the US. He and his family returned to RVA after a year away and have been there ever since (with home assignments in the middle, just like us). What has brought this story to the notice of more than Christians is that Steve set up a charity called Kenyan Kids Can and set about providing the poorest Kenyan government schools in their area with free simple lunches of beans and maize. He progressed on to providing schools with computer centres, allowing these Kenyan kids to learn important skills and hopefully move on to breaking the poverty cycle. By the end of the book he was feeding about 20,000 kids lunch every school day. He received a CNN Hero award. In the midst of all this he talks about his family and work at CVA (he ended up becoming the Guidance Counsellor). Those parts of the story are interesting too. CAJ is the only International School that I've ever encountered at close hand. The comparisons were fascinating. I had trouble putting the book down. Another point of contact was seeing how much difference the investment in one child or adult's life can make. We sponsor a child in Africa and it's exciting to think of the difference that that one little bit could make in his life, and the life of others around him in years to come. Often times I feel helpless in the face of the ginormous problems in this world. It is wonderful to see someone who feels terribly ordinary, making a big difference just where God puts him. I definitely recommend this book, it's a great read. It brings Africa alive in a way I've never experienced before. It also brings you to the realisation that God uses ordinary and weak people in His plans in the most unexpected ways.